There are numerous types of volcanoes or volcanic sources; some of the more common ones are summarized in Table 4.1. Cinder cone Various; some form on the flanks of larger volcanoes Small (10s to 100s of m) and steep (>20°) Most are mafic and form from the gas-rich early stages of a shield- or rift-associated eruption Eve Cone, northern B.C. Kimberlite Upper-mantle sourced The remnants are typically 10s to 100s of m across Most appear to have had explosive eruptions forming cinder cones; the youngest one is over 10 ka old, and all others are over 30 Ma old. Lac de Gras Kimberlite Field, N.W.T. The sizes and shapes of typical shield, composite, and cinder-cone volcanoes are compared in Figure 4.9, although, to be fair, Mauna Loa is the largest shield volcano on Earth; all others are smaller. Mauna Loa rises from the surrounding flat sea floor, and its diameter is in the order of 200 km. Its elevation is 4,169 m above sea level. Mt. St. Helens, a composite volcano, rises above the surrounding hills of the Cascade Range. Its diameter is about 6 km, and its height is 2,550 m above sea level. Cinder cones are much smaller. On this drawing, even a large cinder cone is just a dot. Cinder cones, like Eve Cone in northern B.C. (Figure 4.10), are typically only a few hundred metres in diameter, and few are more than 200 m high. Most are made up of fragments of vesicular mafic rock (scoria) that were expelled as the magma boiled when it approached the surface, creating fire fountains. In many cases, these later became effusive (lava flows) when the gases were depleted. Most cinder cones are monogenetic, meaning that they formed during a single eruptive phase that might have lasted weeks or months. 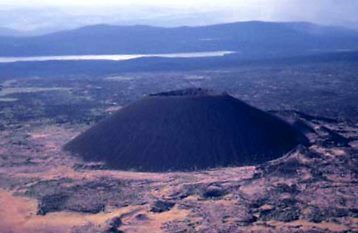 Because cinder cones are made up almost exclusively of loose fragments, they have very little strength. They can be easily, and relatively quickly, eroded away. Composite volcanoes, like Mt. St. Helens in Washington State (Figure 4.11), are almost all associated with subduction at convergent plate boundaries — either ocean-continent or ocean-ocean boundaries (Figure 4.4b). They can extend up to several thousand metres from the surrounding terrain, and, with slopes ranging up to 30˚, are typically up to 10 km across. At many such volcanoes, magma is stored in a magma chamber in the upper part of the crust. For example, at Mt. 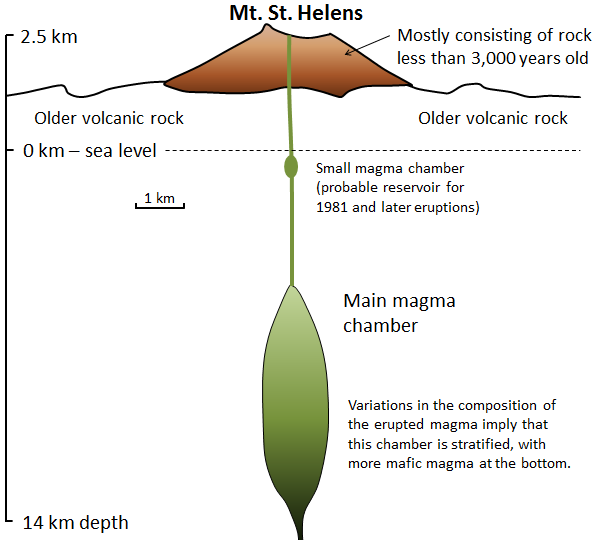 St. Helens, there is evidence of a magma chamber that is approximately 1 km wide and extends from about 6 km to 14 km below the surface (Figure 4.12). Systematic variations in the composition of volcanism over the past several thousand years at Mt. 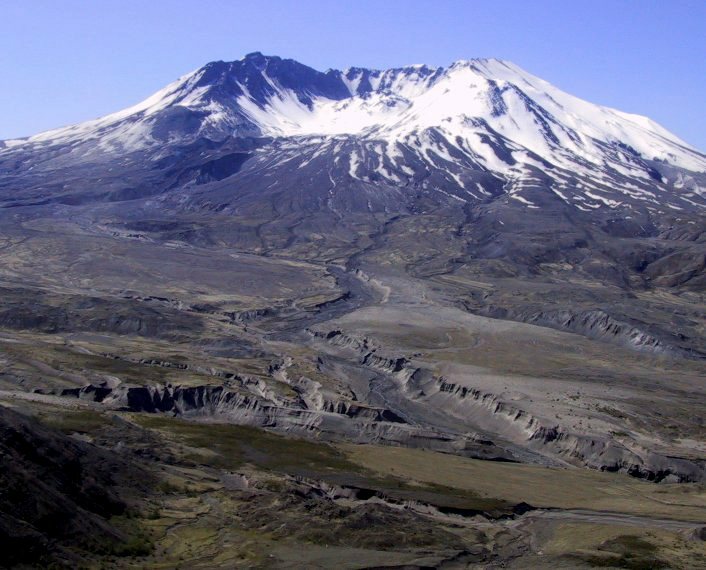 St. Helens imply that the magma chamber is zoned, from more felsic at the top to more mafic at the bottom. Figure 4.11 The north side of Mt. St. Helens in southwestern Washington State, 2003 [SE photo]. The large 1980 eruption reduced the height of the volcano by 400 m, and a sector collapse removed a large part of the northern flank. Between 1980 and 1986 the slow eruption of more mafic and less viscous lava led to construction of a dome inside the crater. Mafic eruptions (and some intermediate eruptions), on the other hand, produce lava flows; the one shown in Figure 4.13b is thick enough (about 10 m in total) to have cooled in a columnar jointing pattern (Figure 4.14). Lava flows both flatten the profile of the volcano (because the lava typically flows farther than pyroclastic debris falls) and protect the fragmental deposits from erosion. Even so, composite volcanoes tend to erode quickly. Patrick Pringle, a volcanologist with the Washington State Department of Natural Resources, describes Mt. St. Helens as a “pile of junk.” The rock that makes up Mt. 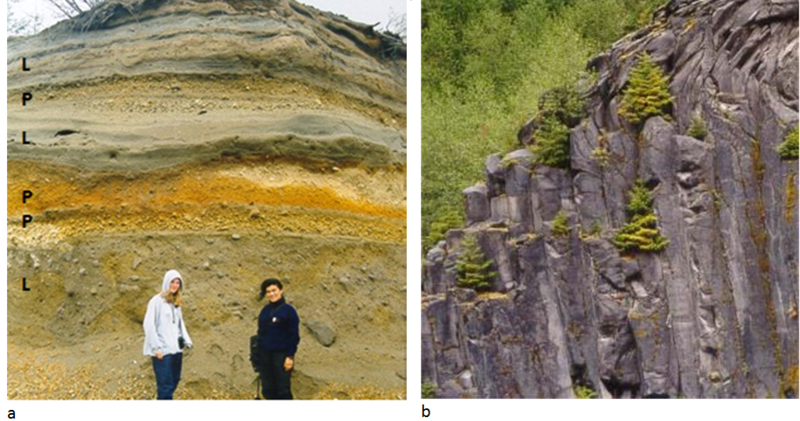 St. Helens ranges in composition from rhyolite (Figure 4.13a) to basalt (Figure 4.13b); this implies that the types of past eruptions have varied widely in character. As already noted, felsic magma doesn’t flow easily and doesn’t allow gases to escape easily. Under these circumstances, pressure builds up until a conduit opens, and then an explosive eruption results from the gas-rich upper part of the magma chamber, producing pyroclastic debris, as shown on Figure 4.13a. This type of eruption can also lead to rapid melting of ice and snow on a volcano, which typically triggers large mudflows known as lahars (Figure 4.13a). Hot, fast-moving pyroclastic flows and lahars are the two main causes of casualties in volcanic eruptions. Pyroclastic flows killed approximately 30,000 people during the 1902 eruption of Mt. Pelée on the Caribbean island of Martinique. Most were incinerated in their homes. In 1985 a massive lahar, triggered by the eruption of Nevado del Ruiz, killed 23,000 people in the Colombian town of Armero, about 50 km from the volcano. In a geological context, composite volcanoes tend to form relatively quickly and do not last very long. Mt. St. Helens, for example, is made up of rock that is all younger than 40,000 years; most of it is younger than 3,000 years. If its volcanic activity ceases, it might erode away within a few tens of thousands of years. This is largely because of the presence of pyroclastic eruptive material, which is not strong. The map shown here illustrates the interactions between the North America, Juan de Fuca, and Pacific Plates off the west coast of Canada and the United States. 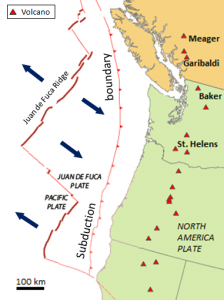 The Juan de Fuca Plate is forming along the Juan de Fuca ridge, and is then subducted beneath the North America Plate along the red line with teeth on it (“Subduction boundary”). 1. Using the scale bar in the lower left of the map, estimate the average distance between the subduction boundary and the Cascadia composite volcanoes. 2. If the subducting Juan de Fuca Plate descends 40 km for every 100 km that it moves inland, what is its likely depth in the area where volcanoes are forming? Most shield volcanoes are associated with mantle plumes, although some form at divergent boundaries, either on land or on the sea floor. Because of their non-viscous mafic magma they tend to have relatively gentle slopes (2 to 10˚) and the larger ones can be over 100 km in diameter. The best-known shield volcanoes are those that make up the Hawaiian Islands, and of these, the only active ones are on the big island of Hawaii. Mauna Loa, the world’s largest volcano and the world’s largest mountain (by volume) last erupted in 1984. Kilauea, arguably the world’s most active volcano, has been erupting, virtually without interruption, since 1983. Loihi is an underwater volcano on the southeastern side of Hawaii. It is last known to have erupted in 1996, but may have erupted since then without being detected. All of the Hawaiian volcanoes are related to the mantle plume that currently lies beneath Mauna Loa, Kilauea, and Loihi (Figure 4.15). In this area, the Pacific Plate is moving northwest at a rate of about 7 cm/year. This means that the earlier formed — and now extinct — volcanoes have now moved well away from the mantle plume. 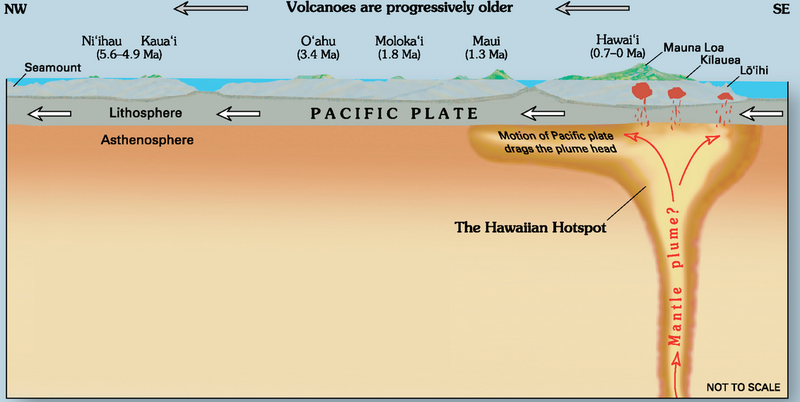 As shown on Figure 4.15, there is evidence of crustal magma chambers beneath all three active Hawaiian volcanoes. At Kilauea, the magma chamber appears to be several kilometres in diameter, and is situated between 8 km and 11 km below surface. Although it is not a prominent mountain (Figure 4.9), Kilauea volcano has a large caldera in its summit area (Figure 4.16). A caldera is a volcanic crater that is more than 2 km in diameter; this one is 4 km long and 3 km wide. It contains a smaller feature called Halema’uma’u crater, which has a total depth of over 200 m below the surrounding area. Most volcanic craters and calderas are formed above magma chambers, and the level of the crater floor is influenced by the amount of pressure exerted by the magma body. During historical times, the floors of both Kilauea caldera and Halema’uma’u crater have moved up during expansion of the magma chamber and down during deflation of the chamber. One of the conspicuous features of Kilauea caldera is rising water vapour (the white cloud in Figure 4.16) and a strong smell of sulphur (Figure 4.17). As is typical in magmatic regions, water is the main volatile component, followed by carbon dioxide and sulphur dioxide. These, and some minor gases, originate from the magma chamber at depth and rise up through cracks in the overlying rock. This degassing of the magma is critical to the style of eruption at Kilauea, which, for most of the past 30 years, has been effusive, not explosive. 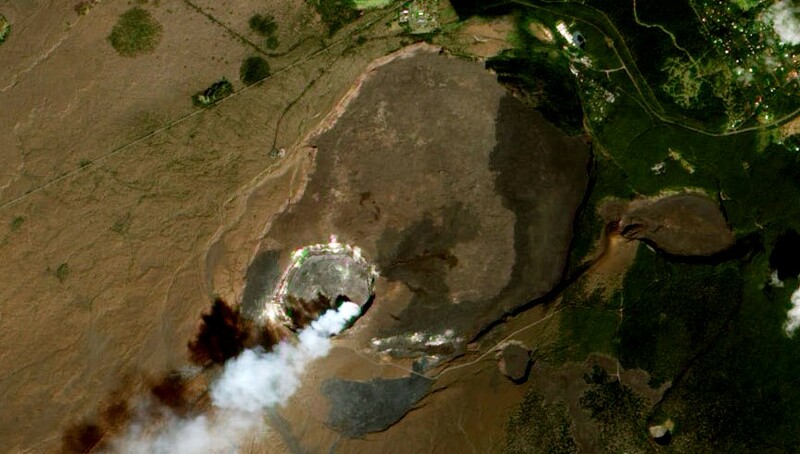 The Kilauea eruption that began in 1983 started with the formation of a cinder cone at Pu’u ’O’o, approximately 15 km east of the caldera (Figure 4.18). The magma feeding this eruption flowed along a major conduit system known as the East Rift, which extends for about 20 km from the caldera, first southeast and then east. Lava fountaining and construction of the Pu’u ’O’o cinder cone (Figure 4.19a) continued until 1986 at which time the flow became effusive. From 1986 to 2014, lava flowed from a gap in the southern flank of Pu’u ’O’o down the slope of Kilauea through a lava tube (Figure 4.19d), emerging at or near the ocean. Since June 2014, the lava has flowed northeast (see Exercise 4.4). The two main types of textures created during effusive subaerial eruptions are pahoehoe and aa. Pahoehoe, ropy lava that forms as non-viscous lava, flows gently, forming a skin that gels and then wrinkles because of ongoing flow of the lava below the surface (Figure 4.19b, and “lava flow video”). 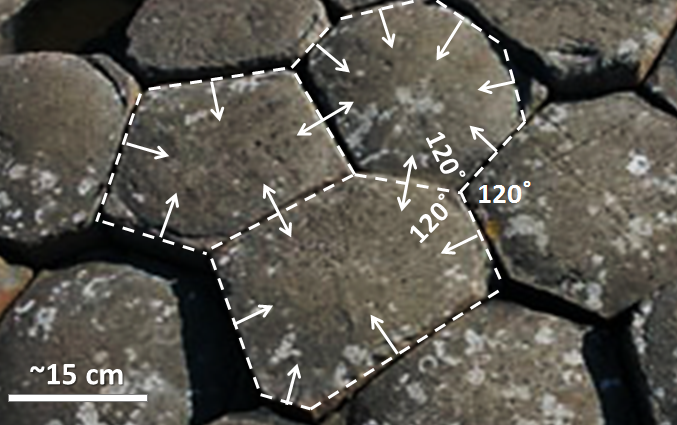 Aa, or blocky lava, forms when magma is forced to flow faster than it is able to (down a slope for example) (Figure 4.19c). Tephra (lava fragments) is produced during explosive eruptions, and accumulates in the vicinity of cinder cones. Figure 4.19d is a view into an active lava tube on the southern edge of Kilauea. The red glow is from a stream of very hot lava (~1200°C) that has flowed underground for most of the 8 km from the Pu’u ’O’o vent. 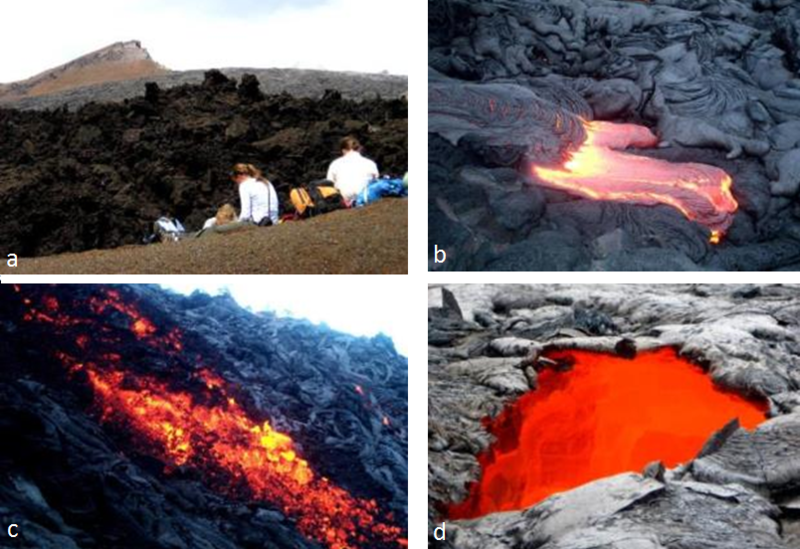 Lava tubes form naturally and readily on both shield and composite volcanoes because flowing mafic lava preferentially cools near its margins, forming solid lava levées that eventually close over the top of the flow. The magma within a lava tube is not exposed to the air, so it remains hot and fluid and can flow for tens of kilometres, thus contributing to the large size and low slopes of shield volcanoes. The Hawaiian volcanoes are riddled with thousands of old lava tubes, some as long as 50 km. Figure 4.19 Images of Kilauea volcano taken in 2002 (b & c) and 2007 (a & d) [SE photos] (a) Pu’u’O’o cinder cone in the background with tephra in the foreground and aa lava in the middle, (b) Formation of pahoehoe on the southern edge of Kilauea, (c) Formation of aa on a steep slope on Kilauea, (d) Skylight in an active lava tube, Kilauea. Kilauea is approximately 300 ka old, while neighbouring Mauna Loa is over 700 ka and Mauna Kea is over 1 Ma. If volcanism continues above the Hawaii mantle plume in the same manner that it has for the past 85 Ma, it is likely that Kilauea will continue to erupt for at least another 500,000 years. By that time, its neighbour, Loihi, will have emerged from the sea floor, and its other neighbours, Mauna Loa and Mauna Kea, will have become significantly eroded, like their cousins, the islands to the northwest (Figure 4.15). 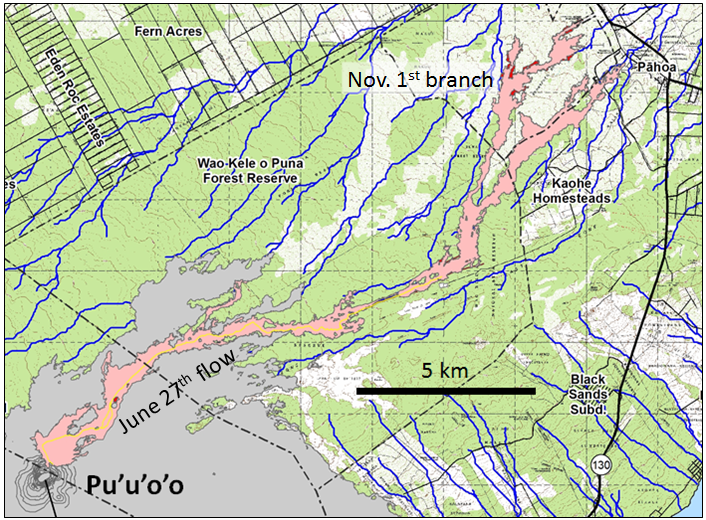 The U.S. Geological Survey Hawaii Volcano Observatory (HVO) map shown here, dated January 29, 2015, shows the outline of lava that started flowing northeast from Pu’u ’O’o on June 27, 2004 (the “June 27th Lava flow,” a.k.a. the “East Rift Lava Flow”). The flow reached the nearest settlement, Pahoa, on October 29, after covering a distance of 20 km in 124 days. After damaging some infrastructure west of Pahoa, the flow stopped advancing. A new outbreak occurred November 1, branching out to the north from the main flow about 6 km southwest of Pahoa. 1. What is the average rate of advance of the flow front from June 27 to October 29, 2014, in m/day and m/hour? 2. Go to the Kilauea page of the HVO website at: http://hvo.wr.usgs.gov/activity/kilaueastatus.php to compare the current status of the June 27th (or East Rift) lava flow with that shown on the map below. While the Hawaii mantle plume has produced a relatively low volume of magma for a very long time (~85 Ma), other mantle plumes are less consistent, and some generate massive volumes of magma over relatively short time periods. Although their origin is still controversial, it is thought that the volcanism leading to large igneous provinces (LIP) is related to very high volume but relatively short duration bursts of magma from mantle plumes. 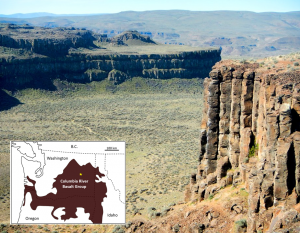 An example of an LIP is the Columbia River Basalt Group (CRGB), which extends across Washington, Oregon, and Idaho (Figure 4.20). This volcanism, which covered an area of about 160,000 km2 with basaltic rock up to several hundred metres thick, took place between 17 and 14 Ma. Most other LIP eruptions are much bigger. The Siberian Traps (also basalt), which erupted at the end of the Permian period at 250 Ma, are estimated to have produced approximately 40 times as much lava as the CRBG. The mantle plume that is assumed to be responsible for the CRBG is now situated beneath the Yellowstone area, where it leads to felsic volcanism. Over the past 2 Ma three very large explosive eruptions at Yellowstone have yielded approximately 900 km3 of felsic magma, about 900 times the volume of the 1980 eruption of Mt. St. Helens, but only 5% of the volume of mafic magma in the CRBG. Some LIP eruptions occur on the sea floor, the largest being the one that created the Ontong Java plateau in the western Pacific Ocean at around 122 Ma. But most sea-floor volcanism originates at divergent boundaries and involves relatively low-volume eruptions. Under these conditions, hot lava that oozes out into the cold seawater quickly cools on the outside and then behaves a little like toothpaste. The resulting blobs of lava are known as pillows, and they tend to form piles around a sea-floor lava vent (Figure 4.21). In terms of area, there is very likely more pillow basalt on the sea floor than any other type of rock on Earth. While all of the volcanism discussed so far is thought to originate from partial melting in the upper mantle or within the crust, there is a special class of volcanoes called kimberlites that have their origins much deeper in the mantle, at depths of 150 km to 450 km. During a kimberlite eruption, material from this depth may make its way to surface quickly (hours to days) with little interaction with the surrounding rocks. As a result, kimberlite eruptive material is representative of mantle compositions: it is ultramafic. Kimberlite eruptions that originate at depths greater than 200 km, within areas beneath old thick crust (shields), traverse the region of stability of diamond in the mantle, and in some cases, bring diamond-bearing material to the surface. All of the diamond deposits on Earth are assumed to have formed in this way; an example is the rich Ekati Mine in the Northwest Territories (Figure 4.22). The kimberlites at Ekati erupted between 45 and 60 Ma. Many kimberlites are older, some much older. There have been no kimberlite eruptions in historic times. The youngest known kimberlites are in the Igwisi Hills in Tanzania and are only about 10,000 years old. The next youngest known are around 30 Ma old. 4.3 Types of Volcanoes by Steven Earle is licensed under a Creative Commons Attribution 4.0 International License, except where otherwise noted.